Traveling to and from Ireland was interesting (as in, "May you live in interesting times", the Chinese curse/blessing). One good thing about the enroute travel delays - the 2 hours we arrived early at LAX for the flight, plus 2 hours for the weather delay, plus 3 hours for the engine malfunction, in addition to the 5+ hour flight; then 5 hours the next day sitting in the airport at JFK, plus the 6+ hour flight to Dublin - was that I got a lot of knitting and crocheting done. 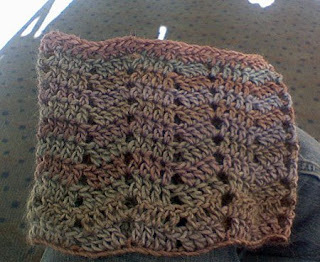 I finished the One Row Lace Cowl (Rav link; non-Ravelry pattern link) in the first two hours. I took Gigi's advice and didn't join the rounds until the fourth row (so I could tell top from bottom and to add a bit of flare.) 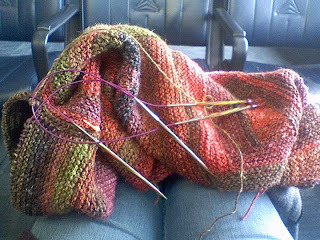 The yarn is leftover from Rachel's Friendship Mittens; it's much prettier than this cell phone pic shows. I finished joining the sleeve and underarm on the first sleeve on the Cozy Jacket (can you see the four knitting needles in this picture? One set for the underarm stitches and another set for the 'live' stitches of the sleeve). Decided I wanted to keep both sleeves at about the same point, so I transferred the first sleeve onto waste yarn, picked up stitches for the second sleeve and underarm, and started working on them. 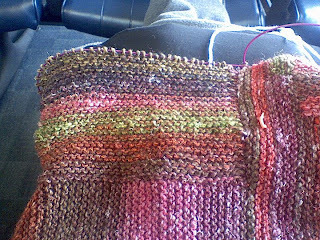 I only knit while we were travelling (not while we were in Ireland) and I still got the second sleeve past the joining and into the decrease section before we arrived back home. 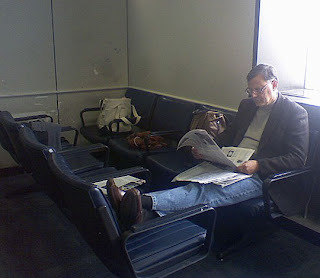 So maybe I should thank Delta for the flight delays? Nah, not going to happen. 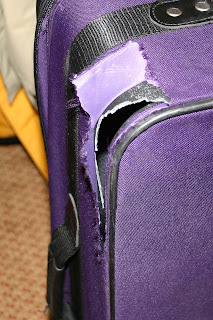 Another thing I'm not going to thank them for is killing my beloved purple suitcase. I've used this case for many trips and although it was scuffed, it was holding up well. Until it met the baggage handlers at Delta. The hard plastic inside the case was completely crushed and the fabric ripped away. 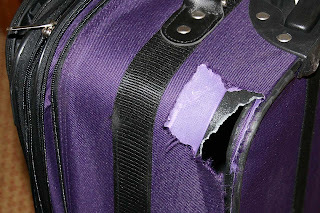 Fortunately, nothing fell out (unlike the suitcase we saw at LAX with the top ripped off and some poor woman's clothes and hair dryer tossed all over the baggage carousel) but it was definitely not usable for the trip home. 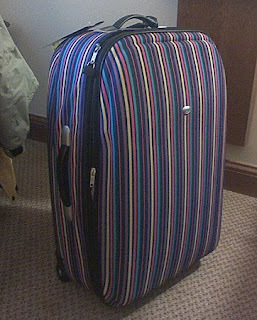 We went shopping in Dublin for a replacement and I was going with the cheapest thing I could find . . . until I saw this - Isn't it fabulous?? And easy to pick out at baggage claim. Bet I'll never see it's twin on any of our trips.